Located on Casey Key Rd, at the end of Laurel Rd. 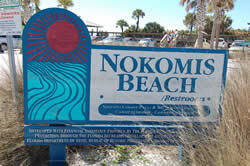 Nokomis Beach is Sarasota County's oldest beach. This is a family oriented beach and is popular for fishing and picnicking. Boat ramp, restrooms, picnic tables with grills. Floating wheel chairs now available. Approx.200 parking spaces, Open from 6:00 am - midnight. Lifeguards on duty.